Beaver County, Pennsylvania is a densely populated rural industrial county that was at the heart of the US steel industry and is now part of the Ohio River valley rust belt. It is traditionally a swing county in the Pittsburgh region of a key electoral state. With young workers seeking jobs elsewhere, the aging population has been trending away from the Democratic Party since Reagan. In 2008 the area was a national focus for the Change to Win Federation and the AFL-CIO’s Campaign 2008 election strategy. The area supported Clinton over Obama in the May primary election by a whopping 70% to 30% and the subtle rhetoric of racism was the political currency in May 2008. The task faced by the labor movement and its progressive allies was to turn the Clinton voting bloc around one-by-one, block-by-block, town-by-town explaining the class self-interest of the voters based on the issues of the economy, workers’ rights, healthcare, and the war, and by confronting the many expressions of racist ideology, racist notions, racist codes, and racist myths. July 1 was the turning point in this effort. AFL-CIO Vice President Rich Trumka denounced racism at the USW Convention. “Well, there’s no evil that’s inflicted more pain and more suffering than racism – and it’s something we in the labor movement have a special responsibility to challenge. It’s our special responsibility because we know, better than anyone else, how racism is used to divide working people.” This speech saw hundreds of thousands of hits on hundreds of union blogs and youtube, and was repeated by international and local union officers at rallies and union meetings across the country. Trumka’s speech awakened and energized labor and progressive activists who poured into the depressed working class neighborhoods of Michigan, Ohio, Indiana, and Pennsylvania to bury right-wing reaction. This ideological offensive by the the union leadership to defeat racist influences among the working class voters had an impact. We could gauge it in the responses to our weekend door-to-door canvassing. By the time beginning of October we were hearing: “I’m a Democrat.” “I’m no fool.” Then around the middle of October the AFL-CIO brought in thousands of yard signs and within a week the region was covered with Obama-Biden yard signs including several dozen varieties of union signs for Obama-Biden. The AFL-CIO Post Election Survey conducted by Hart Research in the key battleground states, including Pennsylvania and Ohio, showed that Obama won 69% of union voters vs. 51% of non-union voters. Among subgroups, Obama won the sixty-five and older union retirees by a 46% margin vs. losing by 8% among all over sixty-five year voters. Similar differences in margins were found among white women, gun owners, regular churchgoers, and veterans. These results were repeated among members of the AFL-CIO’s community organization of non-union members, Working America. Older Working America members gave Obama a 33% victory margin vs the 8% loss among all older voters. The top three issues for union members were the Economy 60%, War in Iraq, 28%, and Health Care 26%. For Working America members, the issues were the Economy 56%, Healthcare 30%, and War in Iraq 26%. The Working America members are less likely to enjoy the health benefits of a union contract and reflect the growth of the healthcare issue in importance for the working class. The survey found that 84% of respondents received election material in the mail from the union, 59% received a live phone call, 32% received a workplace flyer, 21% received a workplace personal contact, and 14% received a home visit. Meticulous records of campaign activities were kept at every union campaign hall. The contacts reported by union members in the survey were the evidence of a massive effort. In just Ohio and Pennsylvania 18.4 million pieces of mail were delivered. 5.0 million doors were knocked. 9.8 million worksite contact were made. And 28.7 million phone calls were placed. Union leaders saw the election campaign as the kick-off for a sustained political action campaign by labor to win back some of the positions lost since Reagan launched the corporate long war against labor by smashing PATCO. Dave Antle, Pennsylvania AFSCME District Council 87 Director: “The election results on Nov. 4th were a great success for the labor movement.This is all thanks to the hard work of union members and their famlies who volunteered with the Labor 2008 program. Because you were out talking to your fellow union members we were able to get our message out to working families. Jack Shea, President Allegheny County Central Labor Council: “The AFL-CIO’s Labor 2008 program once again proved to be the right thing at the right time. Union members in Southwestern Pennsylvania came together like we’ve never seen them do before to work together to make sure every one understood the issues and what was at stake. Our 4th Congressional District Chapter of Progressive Democrats of America supported the Labor 2008 campaign by participating in the walks and phone banks, by publicizing the effort on our website http://www.beavercountyblue.org, by registering voters at churches and township fairs, and by organizing unity events. 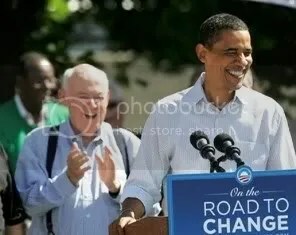 Some members also participated directly in the Obama campaign organization. 2008 was a tipping point in electoral politics. Over many years, the manipulation of the two-party system by the ruling elite had channeled and frustrated movements for change by atomizing the electorate into single issue groups, by marginalizing progressive candidates, by restricting access to the polls by minorities and the poor, and by constructing a nomination process that was arcane, complex, and costly. But this structural narrowing of the electoral playing field turned into its own negation. As the base of the Democratic and Republican parties narrowed, their ability to contain the electoral expression of the popular will was diminished. Over the past five post-McCarthy decades, the periodic heightened ‘class war’ rhetoric of the trade union leadership around national elections was often followed by periods of passivity, false starts, and defeats. Thus, some progressives underestimated the potency of the forces that were to be unleashed by the Labor 2008 campaign. In the fightback against the right wing offensive, the labor movement had accumulated several election cycles of experience developing its electoral organization and the cadre necessary to fully wield its power. In 2008, the labor movement fielded a sophisticated electoral organization, and demonstrated its ability to assess and address the political tasks necessary to defeat reactionary forces. The context of crisis in which this electoral campaign took place changed both the character of the union effort and the mass impact of its campaign rhetoric. This resulted in a qualitatively new political level of unity in the working class. These factors overshadowed inter-union rivalry and the organizational split over how to respond to the corporate offensive. This resulted in a different election campaign in 2008. The level of organization also reached a qualitatively higher level of execution based on the recruitment of younger tech-savvy staff and the established confidence among the local activists in the union political machine built over experience in the past several election cycles. Working class unity was built on the defeat of racism. The Reagan Democrats had been turned by an all-out conscious effort of the union activists and their progressive allies. The election of Barack Obama was an important expression of the growth of working class unity. The vote of the working class as a self-conscious political expression was grounded at the level of personal narrative and local politics. This was due to the leadership role of the trade union movement, which, even though a small fraction of the working class, was the most effective independent organized force articulating the issues of the election in terms of the needs of working families.